Ships churning through the Atlantic Ocean produced this patchwork of bright, criss-crossing cloud trails off the coast of Portugal and Spain. 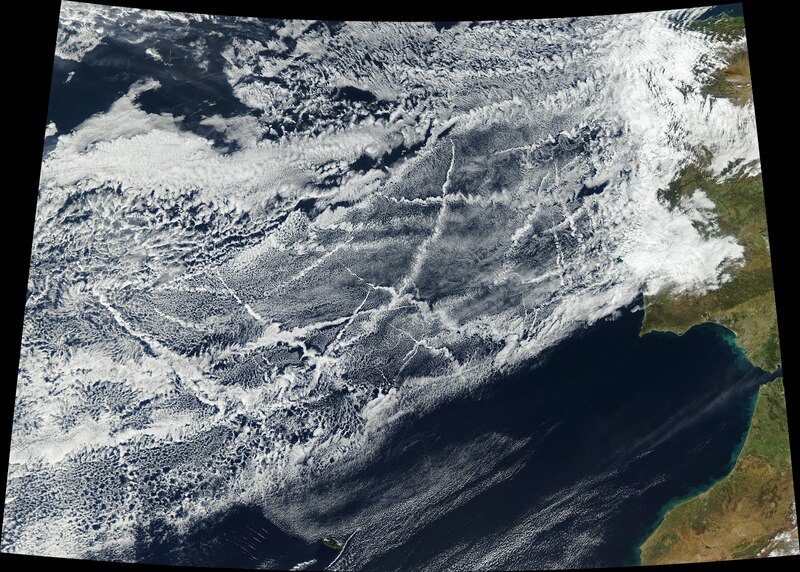 The narrow clouds, known as ship tracks, form when water vapor condenses around tiny particles of pollution that ships emit as exhaust or that form from gases in the exhaust. Ship tracks typically form in areas where low-lying stratus and cumulus clouds are present. The Moderate Resolution Imaging Spectroradiometer (MODIS) aboard the Aqua satellite captured this natural-color image on January 16, 2018. Some of the criss-crossing clouds stretch hundreds of kilometers from end to end. The narrow ends of the clouds are youngest, while the broader, wavier ends are older.